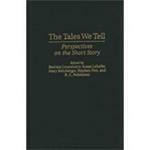 "The Tales We Tell: Perspectives on the Short Story" by Rick Feddersen, Susan Lohafer et al. The 1990s have seen a renaissance in short fiction studies. Today's short story writers are testing the boundaries of short fiction through minimalist works; extended short story cycles; narrative nonfiction forms, such as histories, memoirs, and essays; and even stories created interactively with readers on the computer. Short story critics, in turn, are viewing the short story from the perspective of genre, history, cultural studies, and even cognitive science. This volume brings together the opinions, theories, and research of many of today's best-known short story writers, theorists, and critics. Contributors include some of the most widely read contemporary authors, such as Joyce Carol Oates, John Barth, Gay Talese, W. P. Kinsella, Robert Coover, Barry Hannah, and Leslie Marmon Silko. Feddersen, Rick; Lohafer, Susan; Lounsberry, Barbara; and Rohrberger, Mary, "The Tales We Tell: Perspectives on the Short Story" (1998). Faculty Book Gallery. 457.